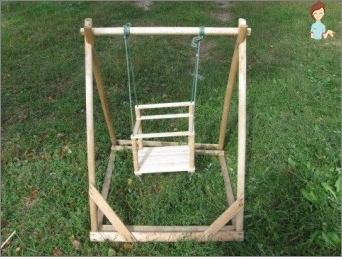 If you have a child and you want to diversifyHis leisure, then try to make a children's hanging swing. For children, and even adults, this is guaranteed to bring a lot of fun. 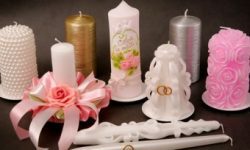 All you need in this business is a bit of free space at the dacha or in the yard, the desire to make such an amusement for yourself, a simple tool and the material itself. The strongest designs, of course,Metal, but since not every dad has access to the welding machine, it is possible to make children's street swings out of wood. 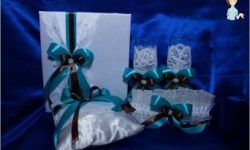 Therefore, when choosing a material, be guided first of all by its capabilities. From the same considerations, choose what to take for supports - metal pipes or wooden beams. 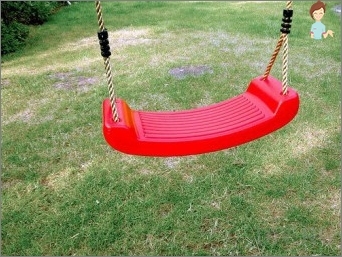 It depends on the material, how much timeWill serve to you and the family built by own hands children's swing. If this tree, then it must be dry. It is worth choosing softwood because it is stronger. And of course it is worth permeating it with a means of decay and insects. When building a swing with your own hands also followsTo take into account for children what age the building is being made. If for small, then you can put and single columns. And if you swing older children or adults, then the supports are made in the form of a triangle of two pillars and a connecting perch cross between them. The buried part of the beams is coated with hot tar and coated with a roofing felt. We choose a seat. It should not be unnecessarily massive. Everyone knows that small children sometimes swing on the swings of their dolls and teddy bears. If the seat is heavy, or God forbid, with metal corners, then such games can inadvertently hurt the baby. For the seat anything, a few knocked down wooden boards, a piece of durable plastic, a board from a skateboard, an automobile tire, a seat from an old chair will do. A vast field for creative imagination. One of the important conditions for installing a swing is a free playground around them. After all, children often do not wait for the seat to stop rocking and jump off it on the run. 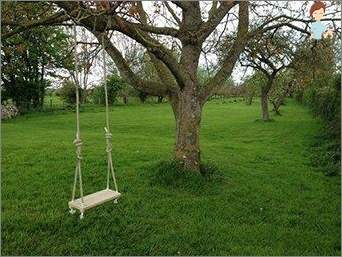 How to make a swing on a tree? By the way, if you want to make a swing, you canGreatly facilitate the whole process - just looking in the garden suitable tree. One thick branch capable of withstanding a load of three hundred kilograms, a car tire or a seat from an old chair and, please, children's entertainment is ready. Only make sure that the branchReally reliable, and in one treacherous moment will not break under the pressure of a riding child. Make it simple. Invite your friends or family to hang on the tree, and if the branch does not crack, consider that your children's swings are half built. For such a swing, instead of a rope, it is better to use chains or knit a rope not to a branch, but to hooks or rings. Children's swing-balancer or swing-scales are anotherA species that is very popular with children and can be easily done by yourself. Children's swing balancer can be both wooden and metal. In case the base is metal, the support is additionally poured with concrete. Balansiers from logs are more stable, due to their heaviness and some massiveness. Two wooden straps for handles. Using two bars, fix the log onThe earth. At its center, drill a hole for the pin, and then fix the board on the log with a pin. On both sides of the board nail the straps for the handles. 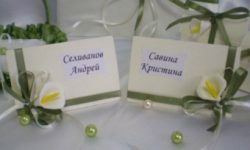 Further, everything can be left, as it is, and you can work a little more, and make seats from rubber, plastic or removable pillows. Place a pillow under the child's seat. Here our swing is ready. Let's ride ? !